While we have discussed this topic many times, I could imagine it's "new" for new Members of the Forum. First (second and third), please – never delete Matterport Spaces from your iPad – unless it is a test scan or a duplicate. Your models WILL have value in the future – even if it is not obvious about what or why. In the short terms, it simply might be reprocessing (as Matterport enhances processing in the cloud). For example, since I started Matterport scanning in July 2014, Matterport has enabled better processing for scans outdoors, processing fluorescent lighting, filling "black holes" and lots of trimming features in the Matterport Capture app. In the long term, imagine this scenario – powered by your Matterport scans. 4. When your iPad is nearly full (again), repeat above. We need a way to archive scans so that we don't have to just delete them to free up storage on our iPads. I know Dan Smigrod has published a method of backing up to multiple iCloud accounts, but that's not an acceptable solution. Whether the data is saved on Matterport's servers or my own computer is unimportant; I just need a way to save these models so that future enhancements may be applied to them. While Matterport has written at length about the step-by-step process to use a different method, I do NOT recommend the alternate, super-geeky solution. For 99 percent of us, this alternate solution is frightening at best (and likely to cause depression and a pit in your stomach when failing to restore successfully). I could also imagine that Matterport will offer all post production in the Cloud too. This will make "One Order/Multiple Matterport Pros" much, much easier. If you have ever engaged a Pro to upload to your Matterport account, you feel the pain of having to ask the Pro to re-trim and upload again. 6. If I update the Matterport Capture app the original files need to be compatible. 7. automatically get archived when the model is uploaded. 9. can be treated separately. For clarification, this means that I do not need to restore all the models to the device. I can pick WHICH model(s) I need to be back on my iPad. ✓ "upload guest" can upload, but can not see or have access to other models. What's your ideal solution for archiving models, if Matterport granted you this wish? Your thoughts about Matterport backup and restore? $36/year seems to better out weight juggling multiple free 5 gig accounts to back up. The reload work and time placing current work on another free account while we access an older account from a forgotten login and password all to juggle my current work back onto the pad seems to be a headache. In the meantime, I need an easy way to take Ricoh photos of my ipad easily as well. I'm about ready to fork out the fee as my ipad hits compacity. Maybe paying the additional to iCloud is the best answer for now to organize and backup our work online. Something our $500 - $1,000 per year hosting doesn't help us with and mac's difficulty to organize our current work for accessibility. Dan I see you shifted us over to this thread for the discussion on memory, file saving and iPads - thanks its' a lot of info sometimes and your doing this stuff in a multi tasking environment - thanks for keeping us organized. I'll continue on this thread. Ok I'm on the right thread now and here's what I did today. I appreciate the iCloud - Mac ID Dan provided as a solution and that is probably the best - I did however find a software named Imazing that does a straight forward time machine like back up of the iPad - so same theory just log what is on what date and then back up - once back up I can then go in and remove scans - I'll so this we a practice scan first to make sure I can recover. If so I'd say it's a perfect solution? Perhaps? I have it set for two computers to back up too and if its' solid then great. I think doing time machine on the Mac offers a second redundant solution as well. Just log in what models or scans are where. And if you need to go back reload that onto the computer and restore the iPad from that time/date Time Machine version - all this is unproven however at this time. 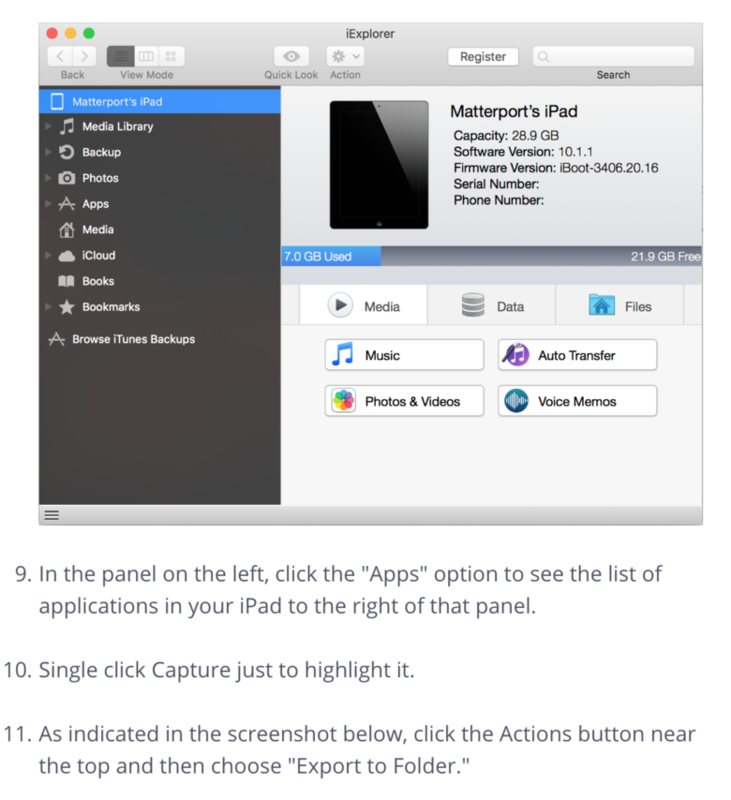 Thank you in advance for testing and reporting back on this TimeMachine like solution for iPad. I downloaded a trial of Imazing today. Not a bad price of $39 - $70 depending on how many computers you want to have access vs Icloud filling up and paying monthly. My dream situation is to find my tours by name and pull them off and add back when needed. Say a home builder wants to use the same model on home using a new model name. That feature not available yet. You're suggesting, when I pull everything off the Ipad, I should make a spreadsheet documenting everything I shot to the date of the Ipad backup. Clear everything off and start over fresh (in the case of Imazing, I could delete tours from the Ipad individualy and keep my other apps on?). I shoot some more scans until it fills up and repeat. In two months, home builder calls me up and asks for the scan with new model name shot last year. I make a new backup and date my current work and drop everything off the Ipad. Get old scan from old backup and upload. Back up again to old date or name on spreadsheet. Go back to my last backup and continue or just start new again. Feels so close using this program seeing the dates of the uploads in the Logs folder, but snooping around the Jobs folder shows you more info that correlates with the Logs. 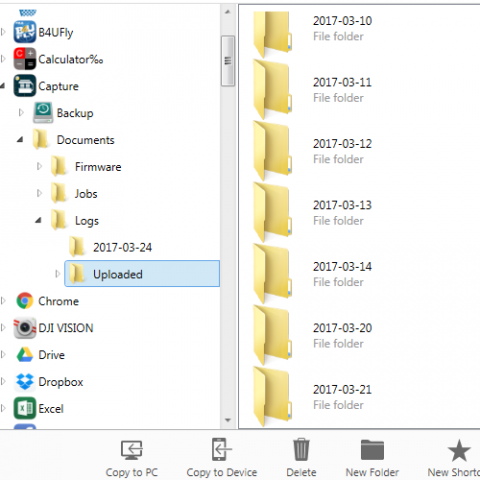 I'm just peeking my way through - nothing is sure yet but given this folder I wonder if you can't just use "copy to device" on the particular job or upload? Right does it not seem like that would work? I think what I'll do when I get time is shot a practice job for this purpose - not big a few cloud points and then use this software, backup - then delete off iPad, - then to back to this software - plug in iPad again and see if I can using copy to device - copy that specific test file back onto the iPad - assuming it will go where it's suppose to? If this works looking at your diagram and it's actually further then I got - I think we might have something right? I'm not coming up with an order in the Jobs file. At the end of the list, I have some external 360's of some homes I took recently and in the middle and beginning I see the same thing. I'm not well versed on Mac. So this is all on the PC version. 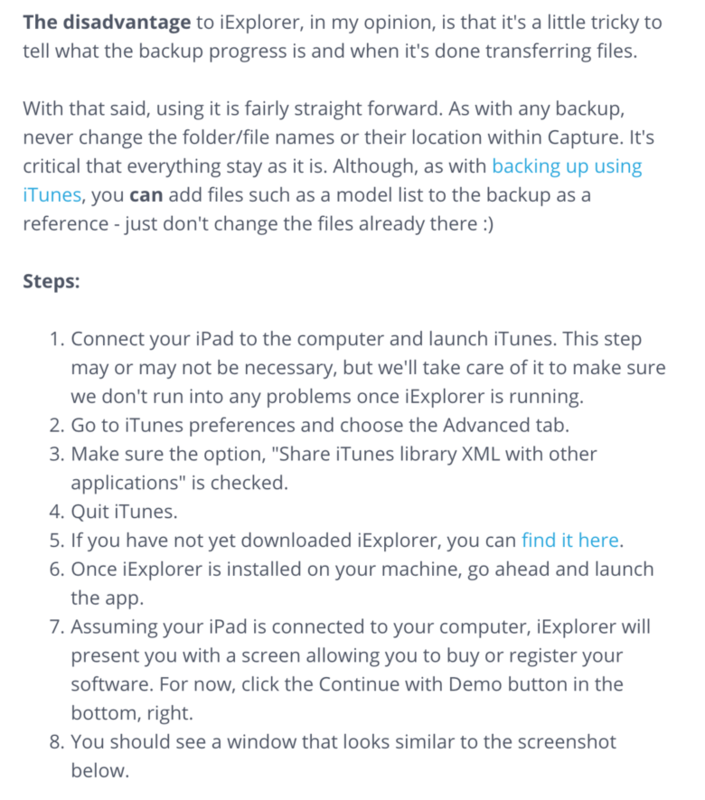 @Spencerlasky I think you found something much easier than clearing the whole Ipad, hoping everything on the capture app is in the mix of the backup every time and completely starting over. I like the idea of just backing up the app, dating it and start over with a new capture App leaving everything else alone. And this App is the easiest way for me to pull pictures like my Ricoh Shots off the Ipad faster. Thank you for sharing. Really there is still no better solution to this ? Given that this was a pain point identified by the We Get Around Network Forum Community in August 2014 – Matterport should be embarrassed. Back and Restore needs to be ridiculously easy. 1. When we upload our models, that should be the Backup. 2. Restore should enable us to add 1 model - or a batch of models - back to our iPad. How hard could this be to implement (other than prioritizing tech time that are likely pulled in many directions). 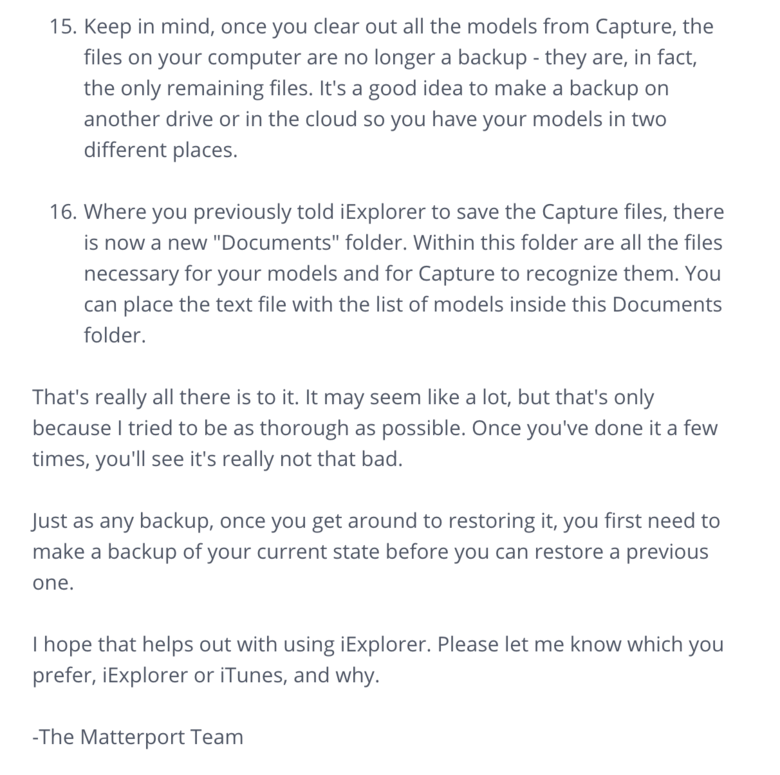 I saw your article on backing up the matterport models, but couldn't check to see if the models were in the icloud? all I can see is other ipad apps that were backed up. do you know how to confirm seeing that your matterport models have been backed up? Essentially you are backing up your entire iPad. And you can restore ALL from iCloud. You can NOT selectively locate or restore individual models because Matterport is a closed, proprietary platform. If you successfully back-up your iPad to iCloud, then you will be able to successfully restore all to your iPad. We (all) wish Matterport provided an easy, fast and simply way to back-up and restore our Matterport Spaces. the big problem with using New Apple ID is: I have a lot of important purchased apple ios program its around 700USD If i use a different id I cannot use my programs any more. What do you think? You can have more that one iCloud account: just keep track of what content is within each iCloud. Anyone wish that Matterport would add a backup solution? And you teached us that it has been already asked for years now. But they are developing other stuff, without caring about their customers. I could imagine that the Matterport tech team is being pulled in many-many-many-many directions. Backup is a big problem. Matterport must deal with this. If you see the time code for the discussion on backup / cloud storage, please post to this discussion. Which goes back to their cloud hosting -- you would not believe how much stuff they host for each scene ... a lot of redundant data for sure... if they NEEDED to, they could reprocess EVERYONE's tours. thanks I've just discovered this as well - iExplorer though I should of followed the thread it would of been faster - Of course I would love a new iPad pro - really do need to buy a new one every time I shoot! I wonder now if I can transfer creation files to another person's iPad/capture app? Lets say a client likes the idea of what I'm doing but decided they should hold all the files? And or get there own subscriptions. I suppose the means they have to buy a camera? 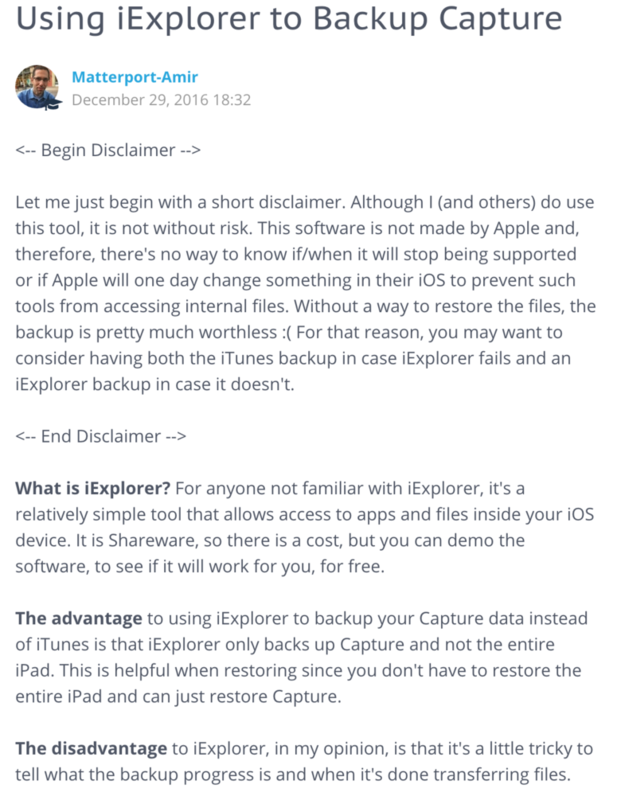 Is anyone using iexplorer on this thread and has actually backup, removed captures and then restored - success in clearing out their memory by storing them, but then putting one back, working on it and having it if that is what is needed? You should test it by yourself to make it works on your ipad. Each one's ipad may be different due to FW version or some other reason. 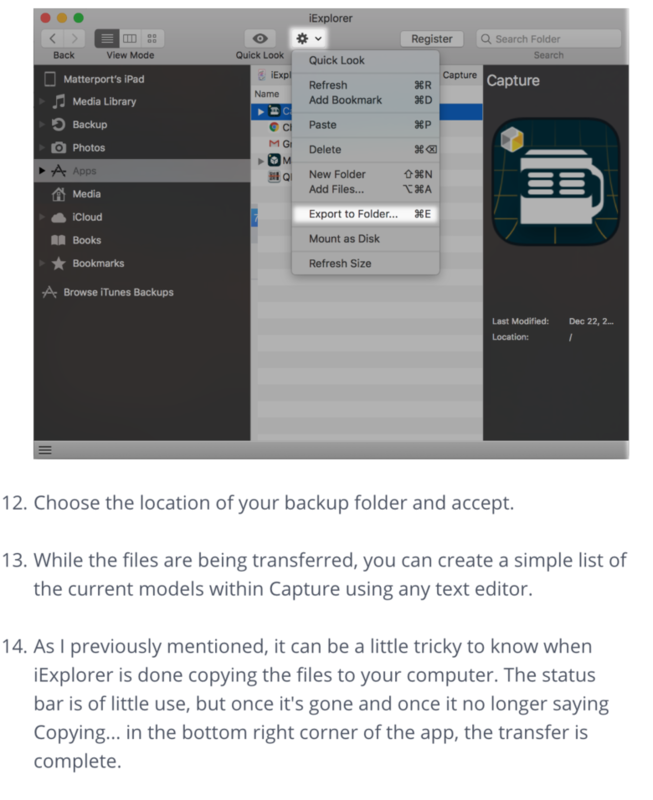 BTW you should backup every thing under the folder of "Matterprot Capture" app, and restore all of them back together. If you only backup the "job" folder that may not work. I remembered that When we talked about it one year ago, some one success. But it is long time ago and "Matterport Capture" may be different through version upgrade. Surprising that Matterport has not provided a Cloud hosted solution for storing and re-storing. No surprise, looks like they have a strategy in place for earning extra bucks by letting third party develop and pay royalty to MP for all such features. Meanwhile focus on building crappy tours with cheap cams aiming for more subscriptions. I do not just wish for it I believe they must provide it. It is not even that hard to implement it in their capture software. All they need to do is to allow move a project back and forth from IPad storage to any type of storage. I would be against if they just create storage in their cloud for backups and start charging fees for that. Simply because we must have a choice to store it even on a thumb drive which will cost us nothing. I think Kumar is right and we most likely to see it to be done by 3rd party rather than Matterport. They did not think of it from a beginning so even if they agree to do it it may take much more time to do it for them that somebody else with IOS developer knowledge can make it and start selling it. @Wingman, it has already there in place. iMazing, iexplorer are couple i know of. As a user I am uncomfortable with reliability point of view. And from RJ's webinar on facebook you can sense this is the way forward for MP. They are looking at platform game with inviting third party developers than doing in house. While building an eco-system is all well, I feel sad to see the OEM not delivering on basic features directly.